Could We Use Epigenetics and Diet to Fix Binge Eating? | What is Epigenetics? Our eating habits can definitely be changed for the worse because of stress, but the reason for an uncontrollable bout of eating may not just be psychological. An underlying epigenetic influence was recently discovered to play a role in binge eating. A new mice study published in Cell Metabolism suggests that a mother’s stress level when she’s pregnant could make her female offspring more likely to engage in binge eating when they grow up. Interestingly, it was also found that certain foods might help alleviate or extinguish binge eating behavior. Pinpointing the molecular underpinnings of binge eating as a result of experiencing stressful events as we age has been difficult. The correlation between the two has been supposed, but the exact biology behind the epidemiological link has not yet been uncovered. “Here we established a model where we can actually show that early life stress increases the likelihood of binge eating in females,” said Alon Chen, senior co-author of the study and a neurobiologist at the Weizmann Institute in Israel and the Max Planck Institute of Psychiatry in Munich, Germany. To assess the influence of prenatal stress, the scientists genetically engineered certain mice so that they could control the circuit in the brain responsible for producing stress hormones, including cortisol. Several systems exist in the brain that play a part in stress, but the group of researchers looked at one specific neuroendocrine circuit known as the CRF (corticotropin-releasing factor) system. Increased CRF activity in humans has been connected to a boost in anxiety, inflammation, and reduced appetite. All of these things have the power to take a significant toll on the body in the long run. In order to put the CRF system in overdrive, the scientists activated it during the pregnant mice’s third trimester. They didn’t want the stress circuits in the mice to engage as a result of the scientists touching and handling the rodents, so they developed a technique that relied on minimal intervention. When these mice gave birth, their female offspring were found to have epigenetic marks in their hypothalami tissue. However, binge eating was not simply caused by these marks. The baby mice only binged when they were put in a stressful situation and had restricted access to food. They could eat as much food as they wanted for 2 hours at a time, three days out of the week. Surprisingly, all female mice ate an excessively large amount of food in this feeding scenario. DNA methylation, the mark that was present on DNA in the female offspring, can be reversed. The researchers wanted to test to see if a certain diet including vitamins such as B12 and folate — which are known as dietary methyl donors — could influence epigenetic tags and reduce binge eating episodes. “Prenatal stress is causing an epigenetic signature in the embryo’s brain,” said Mariana Schroeder, the postdoctoral fellow that led this study. These vitamins, which are methyl donors, may be able to increase the levels of the methyl tag on DNA and correct the epigenetic signature in the brain. 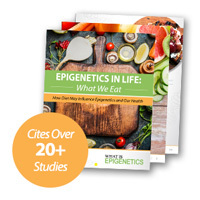 We’ve previously seen that food can have an epigenetic influence on our health and wellbeing. A ketogenic diet could epigenetically sharpen mental ability and sipping tea could turn genes on or off in women. Even eating sweet and fatty foods during pregnancy has been linked to ADHD in children. In this study, once given the methyl donor diet, the genetically adjusted mice did not engage in binge eating behavior. According to the researchers, this suggests that particular dietary choices could help in preventing or at least reducing binge eating. However, the study is still preliminary and additional research should be conducted to confirm the conclusions made. The researchers emphasize that it’s still only a pre-clinical study done on mice. They aren’t certain yet whether a methyl-balanced diet for humans would be similar to the one used for rodents or even be able to control eating disorders. “We found a balance, but it might not be the relevant balance for humans. This is something that needs to be tested,” said Chen. Often times people place stigma on eating disorders, especially binge eating, and blame it on one’s lack of self-control. Studies like these are finding evidence that it’s not just mental, but also might have roots in a person’s genes, or more precisely, the chemical tags that attach to one’s DNA. Source: Schroeder et al. (2017). A methyl balanced diet prevents CRF-induced prenatal stress triggered predisposition to binge eating-like phenotype. Cell Metabolism, 25(6):1269-1281.e6. Reference: Science News. Prenatal stress predisposes female mice to binge eating. Science Daily. 30 May 2017. Web.